Hell Is Eight People Playing As Little Mac In Smash Bros.
You've probably seen eight player Smash Bros. matches already. Let me show you what is bound to happen once you've been playing Smash with friends for a few hours, and everyone has become open to doing terrible, terrible things. 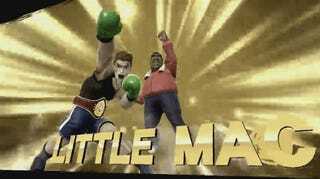 Here's a particular match of note, where we all decided to play as Smash Bros.' most controversial character, Little Mac. I can't decide if I hated this match or loved it. Maybe a little of both. What I do know is that sheenanigans like this are probably going to be very popular during casual play of Smash. I'm player one in this match, by the way. Yes, I lost to a whole bunch of bots. :( (But also some humans!) We would have played on Final Destination to make this particularly awful, but unfortunately that's not an option for 8-player Smash. Why they couldn't make the flattest stage a little longer beats me, but Battlefield ain't so bad as a replacement. I'm particularly a fan of eight player matches with the same character because the results screen is so goofy, as you can see in the initial GIF on this post. Can you really even clap with gloves? Little Mac can, apparently. We're all soooo happy about your win, Samus. Really, great job. Side-note: part of the reason I'm not so big on 8-player Smash isn't just because of the chaos. It's that the camera has to pan out so far, everyone looks like ants. And if I'm playing on the TV, I'd like to be able to see everyone clearly—unlike the 3DS, where everyone is also really tiny. Still, I predict 8-player Smash will be popular anyway.